Amusement Flying Chair is a kind of novel flight tower rideswith capacity of 12 seats, luxurious appearance and decoration, fun form of exercise. Tourists ride in the chairs, slowly rising with the turntable running, as if flying in the sky, and having fun just like being in the undulating sea. Tourists sit under centrifugal force swirling around the pillar, just like the geese flying in the sky and moving up and down, one after another. It’s a very thrilling amusement product. 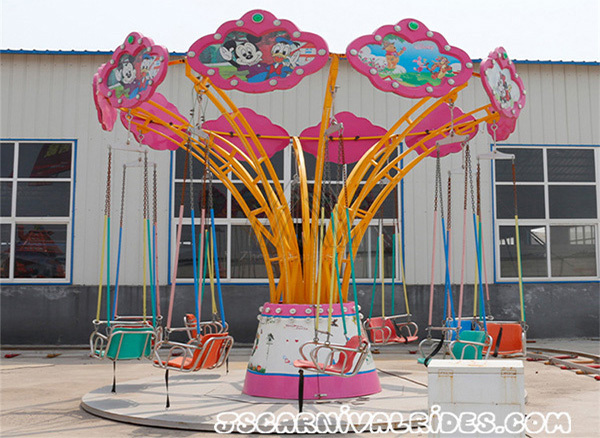 This amusement rides suit for all ages children, especially for the young children.It’s more attractive. Next： Amusement Park Marketing Needs To Catch Five Key Points!